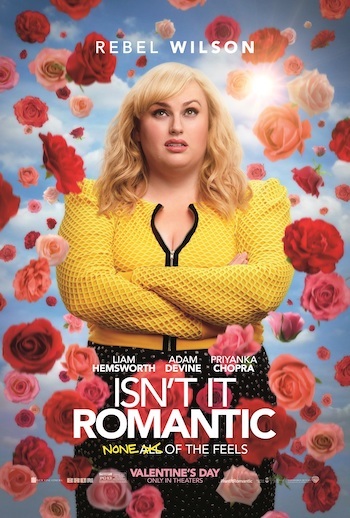 You and a guest are invited to a free advance screening of Isn’t It Romantic! Click here to download your complimentary passes to the special advance screening being held on Thursday, February 7 at 7pm in Salt Lake City. (Passes admit up to two (2) and do not guarantee admission, as the theater is overbooked. Arrive early to line up for ticket exchange!) We’ll see you there! Synopsis: New York City architect Natalie (Rebel Wilson) works hard to get noticed at her job, but is more likely to be asked to deliver coffee and bagels than to design the city’s next skyscraper. And if things weren’t bad enough, Natalie, a lifelong cynic when it comes to love, has an encounter with a mugger that renders her unconscious, waking to discover that her life has suddenly become her worst nightmare—a romantic comedy—and she is the leading lady. #IsntItRomantic open in theaters February 13.